New exoplanets, like those orbiting TRAPPIST-1, are being discovered with staggering frequency. Researchers looking for signals from technologically advanced aliens pick up countless strange pings — but so far, nothing has convinced them that a message really came from aliens. But that doesn't mean there aren't plenty of overblown media headlines about potential alien detections. So a team of researchers pursuing the search for extraterrestrial intelligence, or SETI, has decided to revive a scale meant to ground these detections in reality. They shared their scale, called Rio 2.0, in a new paper that takes aim at SETI researchers and the media for irresponsible coverage of potential detections. The new study builds on a similar effort, called the Rio Scale, which was developed in 2000 and was presented at the 51st International Astronautical Congress held in Rio de Janeiro the next year. But since the original scale was developed, SETI scientists have decided that the evaluation needed some updating, particularly given the breakneck pace of online media. The new version of the scale creates the same output: a score ranging from 0 to 10 meant to convey the importance of a signal detection, with 0 representing a detection of no importance and 10 indicating one of extraordinary importance. But the new research proposes tweaking the way that score is calculated to try to make it a better representation of the factors that determine a detection's true significance and to make the tool easier for scientists to use to evaluate their own signals and those of their colleagues. That initial score is then meant to be revised as additional data are gathered, the researchers explained. The co-authors of the new research, who include some of the same people behind the 2001 scale, hope that reviving the scale will help the public and the media evaluate the importance of a signal — sort of like the alien equivalent of the Richter scale, co-author Jill Tarter, a SETI researcher based at the SETI Institute, said in the statement. "The SETI community is attempting to create a scale that can accompany reports of any claims of the detection of extraterrestrial intelligence and be refined over time as more data become available," Tarter said. "This scale should convey both the significance and credibility of the claimed detection." 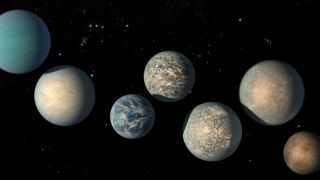 The research was described in a paper published July 24 in the International Journal of Astrobiology, and the researchers have set up an online calculator to produce the scores. So far, the scientists wrote, the majority of the detections they've run through the calculator have come back with a score of 0, which means it's still much too early to get excited about alien communications.